I refuse to be pessimistic. I don't believe in it. I hope that we can find a way to keep from destroying the earth. 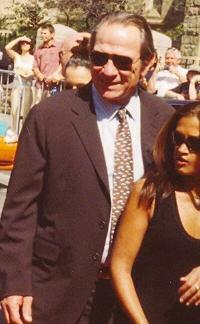 Tommy Lee Jones (born 15 September 1946) is an American actor and director. The old-timers thought, Well, fire's bad; we'll get rid of it. That was certainly a mistake. We have to get it back into the system somehow, in safe, controlled ways. The old-timers thought, Well, fire's bad; we'll get rid of it. That was certainly a mistake. We have to get it back into the system somehow, in safe, controlled ways. That's what I'm into now. On the errors of trying to completely eliminate forest fires, because of the disruption of growth cycles that make those that do occur more destructive and harder to control. Create turf, save water. Those are the two main principles. And, you know, keep everything alive. Maintain a game habitat. That's important so that you have an entire system at work. Cattle are going to do better, oddly enough, if the birds are doing good and the deer are doing good. You try to manage the whole thing. I'm one of those people who feels that agriculture is a creative act. It's a very fine art — that's the way I approach it. It makes me feel like a very special person, that I'm able to make my living with my imagination. I developed a big respect for my calling while I was in school, and it remains with me to this day. I'm really concerned about the quality of education in the United States. I think it's going down, and I don't think we spend enough money on it. It's unhealthy for our society that we remove ourselves more and more every day from books, from reading, from writing. All areas of education need more emphasis. I think we're a bit lazy here in America. I believe in the ideal of the classic liberal education, and I also think athletics are very important to the education of young people. This page was last edited on 15 April 2019, at 20:03.